What is a “blowout panel”? The Japan Atomic Power Company (JAPC) has implemented design changes, additions and tests regarding the screening of the Tokai No.2 reactor building blowout panels. The blowout panel is a device that prevents destruction of the reactor building by automatically releasing pressure from the building when pressure rises inside it. Problems were pointed out after hydrogen explosions occurred in reactor buildings during the Fukushima accident. In November 2017, the condition that “it must be possible to shut the blowout panel after it has opened” was added to the safety regulations. Tokai No.2 developed a blowout panel closure device and performed vibration tests to verify its function (opening-closing, airtightness) after an earthquake. Technical problems were pointed out after the tests, and the principle issue is that the blowout panel is related to the structure of the reactor building itself and the design of several systems within it. This article takes an overall look at this issue, and having looked at the design conditions, considers their validity and the setting of severe accident conditions, and examines the blowout panel design standards and operation in detail. The boiling water reactor (BWR) containment vessel is known as the Primary Containment Vessel (PCV), which is intended to confine radioactive materials during an accident. If, for instance, a pipe ruptures inside the PCV in a loss-of-coolant accident, the PCV swells like a balloon to maintain its strength under the internal pressure. In the case of the Mark II PCV pressure boundary at Tokai No.2, the design pressure is 310 kPa(G) (kilopascals at a gauge [G] reading that sets atmospheric pressure at zero), or roughly 3.1 atm (atmospheres) (G). With a diameter of about 26m and a steel plate thickness of 20-30mm, the PCV is a welded structure having a diameter/plate thickness ratio of nearly 1000. The design pressure of 3.1 atm means that the PCV will withstand twice that pressure (around 6.2 atm) in a severe accident. When external pressure exceeds internal pressure, however, the design pressure of the PCV shell is much lower, collapsing at a pressure differential of around 0.14 atm (2 psi [lb/sq. inch] or roughly 13.7 kPa), rather like an aluminum beer can. This is known as external pressure buckling, and since it can occur at 1/20 or less of the internal design pressure it is necessary to maintain external pressure on the PCV at a low value – the allowable pressure being half or less than the external pressure buckling strength of the PCV, or 1 psi (6.9 kPa). The reactor building, the secondary containment, is constructed to surround the PCV, the fuel exchange floor (top floor) and the spent fuel pool (SFP). It is a steel-reinforced concrete structure (Fig.1). To contain any radioactive materials that might leak from the PCV in an accident, air conditioning maintains a small negative pressure inside the reactor building. However, since the steel-reinforced concrete structure has flat walls and floors, the building’s pressure tolerance is far smaller than the PCV. Thus, if the main steam pipe carrying steam from the reactor to the turbine (passing through the PCV) experiences a rupture accident outside the PCV but inside the reactor building, pressure inside the reactor building will rise sharply. Since the reactor building walls may be blown out or the PCV experience external pressure buckling, blowout panels are installed in the upper part of the reactor building and are designed to blow out automatically to release pressure inside the building when it reaches 1 psi (6.9 kPa). To prevent the entry of radioactive materials into the NPP central control room at the time of an accident, a lid-like isolation damper closes to shut out external air, and the standby gas treatment system (SGTS) removes radioactive materials while circulating air. The central control room is isolated when leaks occur from the reactor, when the blowout panel opens or if there is a failure to maintain the airtightness of the reactor building, but the isolation damper may leak somewhat, or a breakdown or malfunction of the SGTS may expose operators to the danger of contaminated air. Twelve blowout panels are installed in the outer wall of the reactor building at Tokai No.2. As secondary containment, the building is required to be airtight, but in the case of an accident such as that mentioned above, the blowout panels are required to open to relieve pressure inside the buildings by releasing steam to the environment. Each panel measures approximately 4.1m × 3.7m and four or more panels are required to open in the case of a pressure rise. The design pressure differential is 6.9 kPa for the blowout and each panel is held in place by 18 clips of a load of about 104 kN (kilonewtons, 10.7 tons). When pressure rises inside the building, the panels are required to blow out automatically without dependence on a power supply or pressurized air supply. However, the panels are large, and as there is a variation in pressure on each of the clips, it is not certain that the panels will open. If the case of a tornado, design conditions presume an instantaneous maximum wind speed of 100m/s, but there is a possibility that blowout panels may still open due to a pressure differential as the external air pressure drops in a tornado. It is required that equipment inside the reactor building be protected from the tornado. As the possibility of the simultaneous occurrence of an accident requiring the building containment function and a tornado that blows out the panels is very low, the panels are fitted with chains to prevent them falling to the ground. They can then be returned to their original positions later. However, the important question is how long it would take to resume airtightness. A protective net is to be installed to prevent disturbances to the functioning of the blowout panels and separately-installed sliding doors from objects blown around in a tornado. It was thus decided to install sliding doors over the blowout panel openings. Function 5: To release water to the SFP from water cannon when there is large-scale damage, it must be possible to open the necessary locations manually. As a countermeasure, a hydraulic jack mechanism was added to open the blowout panels, and the design of the sliding doors was altered to both open or close the blowout panel opening. 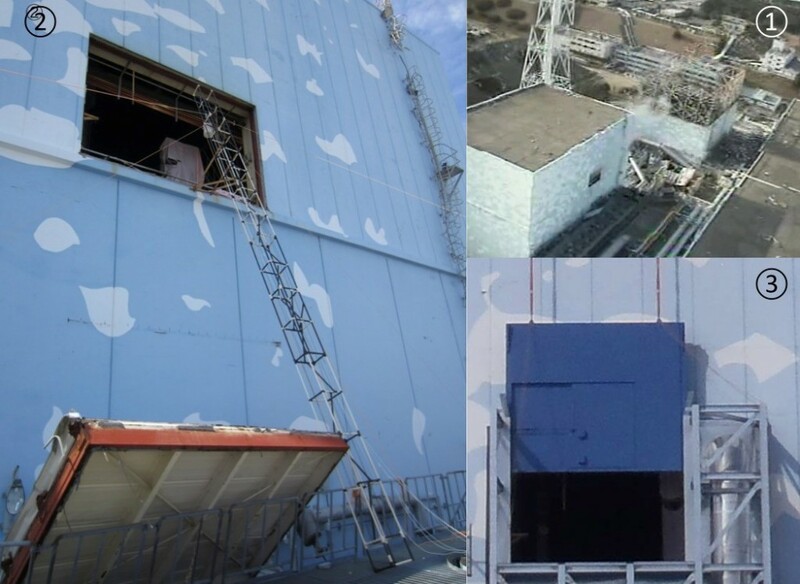 JAPC conducted tests on the blowout panel structure and sliding doors right up to the screening by the Nuclear Regulation Authority (NRA) in June 2018, but many glitches occurred during the tests. One was that, regardless of whether the sliding doors were open or closed, when a vibration test at or above the design reference seismic motion Ss was performed, damage occurred to the electrical drive chain. Discussions are continuing on whether to add a door bolt or use a higher quality chain. However, if the load and displacement bearing on the structure during an earthquake, and the strength, cannot be evaluated in advance using a vibration test that can perform an adequate strength test, the possibility cannot be denied that the anti-seismic design of other important parts may be inadequate. Another was that when a vibration at the Ss level was applied to the doors in the closed position, the doors slid open about 300mm and a gap of about 50mm occurred in the packing material that maintained airtightness. In another vibration test, doors slid open about 85mm from the fully closed position. It is said that JAPC is investigating the amount of chain elongation, but with this repeated trial-and-error situation it is hard to understand how NRA can grant the ‘alteration of installation’ approval. 1) The reactor building is secondary containment that has the function of containing radioactive materials. The dynamic equipment of SGTS lacks reliability because there is a possibility it may leak, therefore negative pressure could not be maintained. 2) If a main steam pipe rupture occurs outside the PCV, the main steam isolation valve will close in less than 5 seconds. The blowout panels were added to the original design because of possible sudden rise in pressure in the reactor building. 3) If the blowout panels lose their function, once the pressure inside the reactor building rises to a certain level an extremely severe accident such as collapse of the reactor building or buckling of the PCV will occur. 4) Therefore, the accuracy of the 6.9 kPa pressure at which the panels blow out is crucial. 5) As the reactor building will lose its secondary containment function if the blowout panels are open, they must be quickly closed. How long that will take is unknown. If there is a leak in the main steam isolation valve, radioactive materials will continue to escape. 6) That the blowout panels themselves breach the secondary containment boundary when there is a main steam pipe design reference accident is a basic design problem. 7) The PCV is weak against external pressure. It is normally in a positive pressure state, but at the time of an accident the pressure may become negative due to the PCV spray. Delay in operation of the vacuum break valve will cause external pressure buckling of the PCV. 8) Reliability of secondary containment is seriously compromised by the low internal pressure limit of 6.9 kPa of the reactor building. It is unreasonable to require the containment function of the blowout panels, which were designed on the supposition of a design reference accident, in a severe accident following reactor core damage. Depending on the state of the accident, it is unknown whether or not the panels can be reclosed after they have blown out. It will be impossible to maintain the containment function if large amounts of radioactive materials are leaking out. 9) Moreover, since the blowout panels themselves are inadequate, sliding doors, earthquake resistance, and tornado protection have also been required. Using sliding doors in the place of blown out panels will make it impossible to prevent the rise in pressure, leading to destruction of the reactor building or PCV if there is a major release from the main steam line. 10) There is a strong possibility that a hydrogen explosion cannot be prevented. If there is a hydrogen leak from the PCV, as occurred at Fukushima, even if the hydrogen concentration rises, the operation pressure of the blowout panels may not be reached. If a hydrogen explosion occurs, the explosive power acts instantaneously, making the blowout panels totally useless and destroying the reactor building. 11) It is unreasonable that the radioactive materials containment function consists of the reactor containment vessel as the PCV with a design pressure of 3 to 4 atm and a secondary containment facility, the reactor building, with a design pressure of roughly 0.14 atm. Since leakage will possibly occur from the PCV in a severe accident, the secondary containment will be useless in a severe accident such as reactor core meltdown, and many of the contradictions of NPP design will appear. 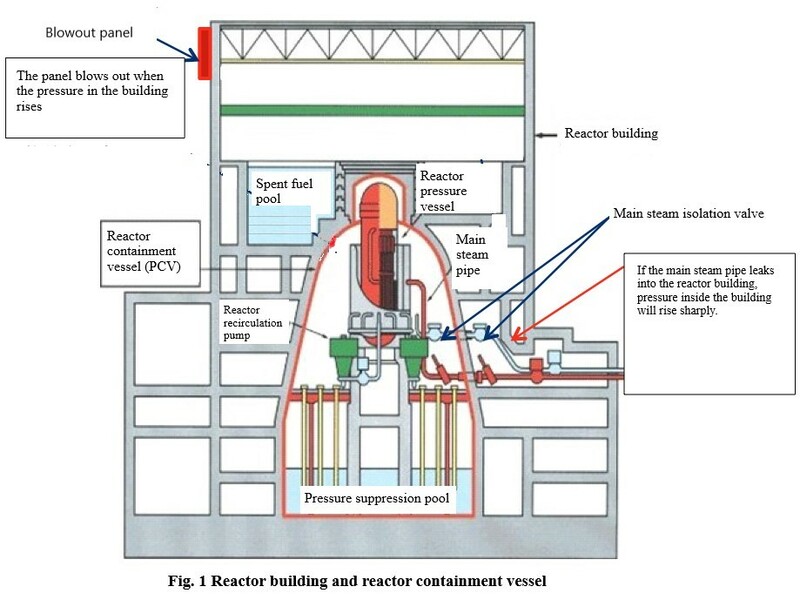 12) Thus, with current BWR design, even putting aside the facts that the PCV is small and the pressure suppression function is unreliable, it is a serious problem that the reactor building will not withstand an occurrence such as a ‘containment bypass’ (main steam pipe rupture). JAPC’s blowout panel woes are not simply a problem of inadequate testing or lack of preparations. It makes one wonder if there isn’t a lack of fundamental technical ability regarding load evaluation, strength and function maintenance in basic anti-seismic design. Further, if we were sincere about learning the lessons of the Fukushima accident, since the blowout panel problem is related to a large number of problems of basic systems design, including the reactor containment vessel, the reactor building, loss-of-coolant accidents, the STGS, hydrogen explosion prevention, anti-seismic design and tornado resistance design, it is not half-baked countermeasures but a draconian reappraisal of the basic design of NPP buildings, etc. that is needed. Granting approval for Tokai No.2 without a review that returns to the screening for permission to alter the installation will cause people to doubt the quality of the screening for compliance with the new regulation standards. Previous story CNIC Statement: Don’t allow Tokai No. 2 NPP to operate beyond 40 years!